Is Fan TV the purple all-in-one set-top device you’ve been waiting for? Fanhattan, the popular TV aggregation app for iOS (and now for Web as well) used an appearance at D11 to unveil a new expansion into hardware that was apparently years in the making. The result of the company’s years of super secret development was a stylish little purple set-top streaming device known as Fan TV. The sleek Yves-Béhar designed set-top box resembles a palm-sized purple butter tray. 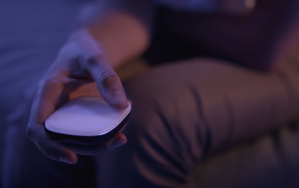 The remote is a minimalist, button-free magic mouse-like device that allows users to swipe and scroll through their TV content. Like Roku or Apple TV, Fan TV will offer on-demand and streaming content, but Fanhattan's innovation is a unified search that works across all content services (Hulu, Amazon, Crackle, etc). Additionally, Fan TV will offer live TV and cloud DVR storage. The company is currenly working with TV providers to bring the set-top to market. Like the recently unveiled Xbox One, Fan TV promotes itself as the de-cluttering living room device to rule them all. The new Xbox has at least two legs up on Fan TV, however: 1) it will have the ability to play Blu-rays and DVDs such as they are still used, and 2) will be a brawny game console that you may have heard about. Fan TV is expected to be available later this year for an undisclosed price and via undisclosed pay TV partners.